County Donegal has eleven lighthouses including Ireland's most northerly lighthouse, Inistrahull off the coast of Malin Head. Photographs and information about Arranmore. Photographs and information about Burtonport. 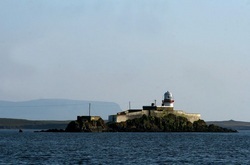 Buncrana lighthouse is situated on the pier in the town of Buncrana. Photographs and information about Buncrana. 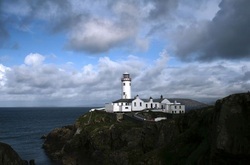 Situated at the tip of the Fanad peninsula. The Inishowen lighthouse is situated near the town of Moville and right beside the beautiful sandy beach at Shroove (sometimes spelled Shrove or Stroove). 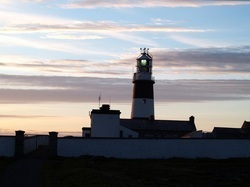 The lighthouse at Inishtrahull is the most northerly lighthouse in Ireland. It sits on the tiny rocky island of Inishtrahull which is about one mile long and the island is approximately 10 km/6 miles of the coast of Malin Head's most northerly point, Banba's Crown. Photograph by kind courtesy of Colm O'Laoi. Rathlin O'Birne lighthouse is situated on a tiny island at the tip of the sea entrance to Sliabh Liag (Slieve League) cliffs. Photographs and information about Sliabh Liag/Slieve League. Rotten Island lighthouse is situated on a small island at the edge of the port of Killybegs. Photographs and information about Killybegs. 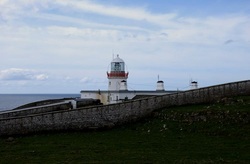 St. John's Point lighthouse is situated right down at the far end of St. John's Point, Dunkineely. 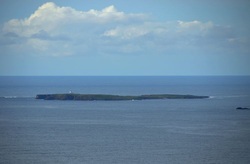 Photographs and information about St. John's Point and Dunkineely. 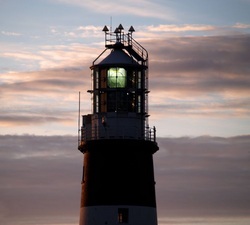 Tory Island lighthouse is situated on the west tip of the island. Photographs and information about Tory Island.